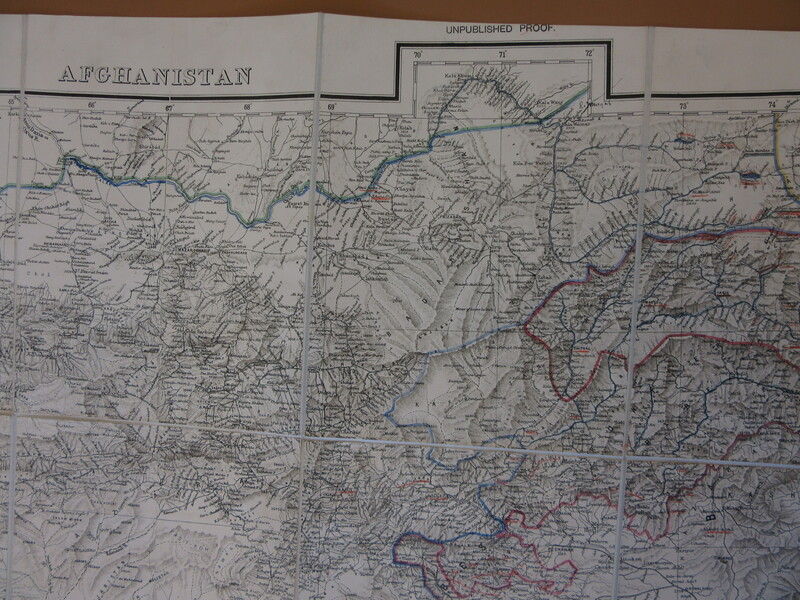 This map of the north west frontier of India reveals some fascinating political manoeuvres. Produced in 1889 and titled simply ‘Afghanistan’, it shows the boundaries between British India and Afghanistan. It was made during the period sometimes described as the Great Game, when the imperial ambitions of Russia and Great Britain were fought out in the border regions of Afghanistan. The map is accompanied by a letter, dated 1890, from W.J. 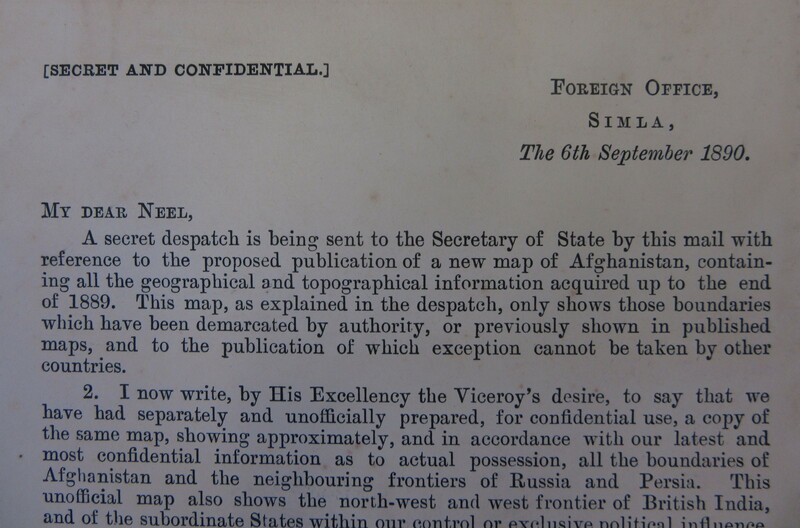 Cuningham of the Foreign Office in Simla, which makes clear that the map was intended to publicise the British view of the boundaries, but unofficially and in a rather underhand way. The accompanying map – ‘unofficially prepared, for confidential use’ shows the actual situation on the ground, and the territories controlled by Afghanistan, Russia and British India. The map is a Survey of India unpublished proof, and boundaries, some of them complex, are marked by hand in colour. The situation the map shows is a complex and confusing one. There is no key, but Afghanistan is outlined in blue, India in red and Russian territory in green. 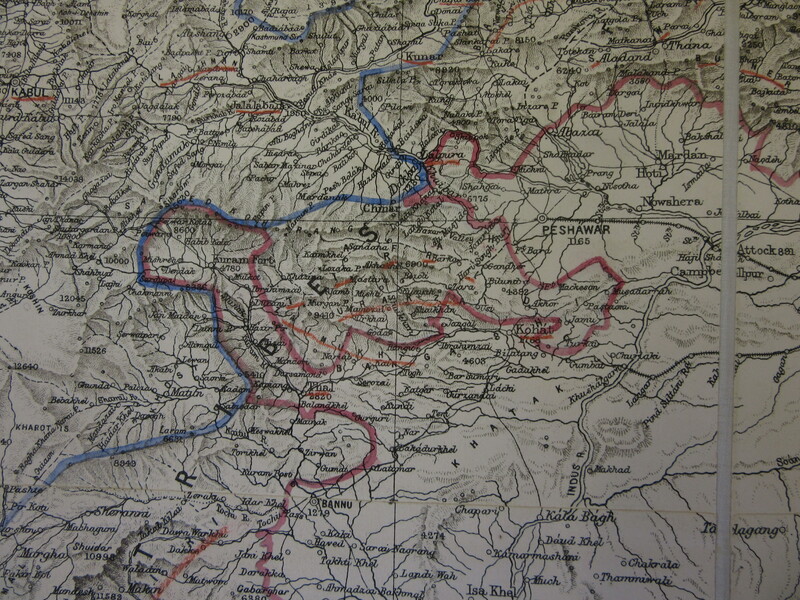 Between the red and blue lines there are territories enclosed by neither and marked ‘Frontier tribes’ – the Survey’s finely hachured relief making clear that the area is mountainous and inaccessible. The border between Afghanisatan and Pakistan now runs through the region; it was divided by the Durand Line in 1896 and is still disputed today. This entry was posted in History, Military on 26 April 2018 by debbie.